Whilst many of us outside of the United States would consider ‘nutters with automatic weaponry’ to be a likely category in the top ten of American fears, in reality, it doesn’t even figure. A look at the stats for US mortality causes shows that there’s logic to that. A US citizen is markedly more at risk of dying from prescription opiates (often taken for chronic conditions which aren’t adequately covered by the user’s healthcare plan) than by a random bullet. Which might explain why Trumpcare is in second place on the fears list. 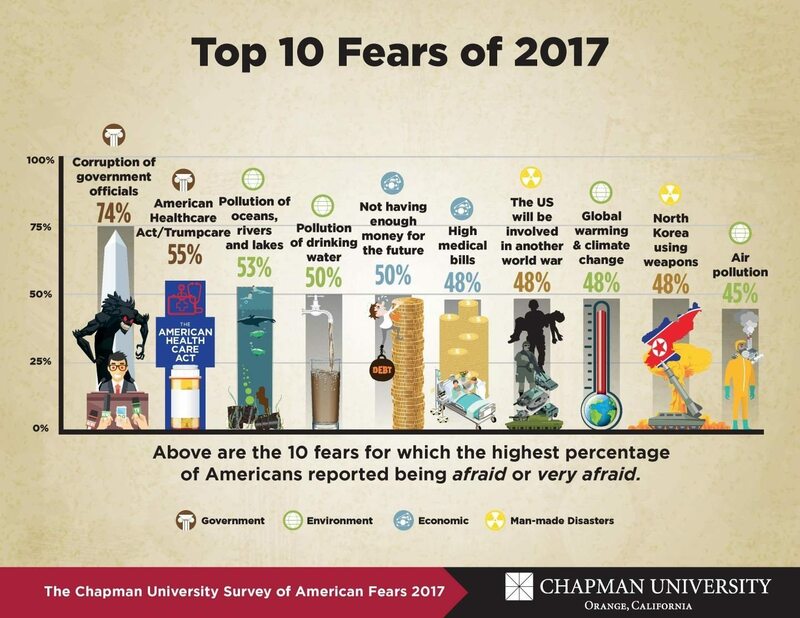 Chapman University recently completed its fourth annual Chapman University Survey of American Fears (2017). The survey asked respondents about 80 different fears across a broad range of categories including fears about the government, the environment, terrorism, health, natural disasters, and finances, as well as fears of public speaking, spiders, heights, ghosts and many other personal anxieties. In addition to the set of fears examined in previous waves, the survey team took a closer look at one particular fear-related phenomena: fear of extremism. In its fourth year, the annual Chapman University Survey of American Fears included more than 1,207 adult participants from across the nation and all walks of life that is a direct slice of the American population according to census data. The 2017 survey data is organized into four basic categories: personal fears, natural disasters, paranormal fears, and fear of extremism. Most striking about American fear in 2017 is that environmental fears figure more prominently than ever before. Environmental issues never cracked the top ten fears in previous surveys. Water pollution ranks third overall, followed closely by drinking water quality. The fact that water pollution has become such a prominent fear in 2017 may be traced to the reversal of environmental policies of the Obama Administration. 50.4 percent fear for the quality of their drinking water. This could be linked to the prominent news coverage of lead poisoning in the drinking water of Flint, Michigan, during the past year. Americans fear climate change [48 percent] and air pollution [44.9 percent]. These are the eighth and tenth greatest fears, respectively.The sharp rise in the number of Americans who now say they fear climate change (and air pollution, which contributes to climate change) may be linked to President Trump’s controversial decision to withdraw from the Paris Climate Accord. Americans believe that both Islamic Extremists and White Supremacists represent a threat to national security. Three out of five Americans report they are very afraid or afraid that Islamic Extremists/Jihadists are a threat to national security. After Islamic Extremists/Jihadists, White Supremacists are the only group that a majority of Americans view as a threat to national security (51 percent). This fear affects the daily lives of Americans and even leads some to question the value of American freedom?29 percent of Americans report being very afraid or afraid of being a victim of hate crime. One-third agree or strongly agree with the statement, “In order to curb terrorism in this country, it will be necessary to give up some civil liberties.” Even more, 35 percent, disagree or strongly disagree with the statement, “We should preserve our freedoms even if it increases the risk of terrorism.” As has been seen before, elevated fears over national security can lead to lower support for national values. Nearly half of all Americans [48 percent] fear North Korea using nuclear weapons and 41 percent fear a nuclear attack generally. 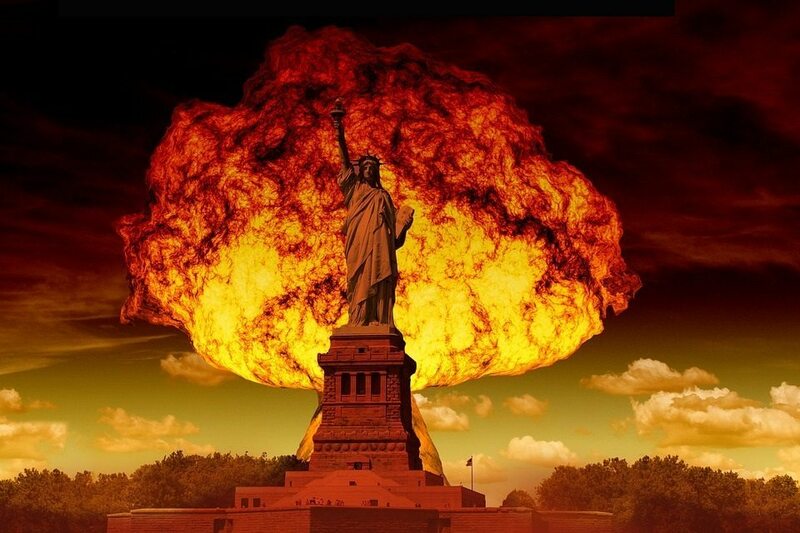 The prospect of a nuclear meltdown has made 31 percent afraid or very afraid. 48 percent fear being the victim of terrorism and 44 percent fear a terror attack in general. The majority of Americans, 82 percent are familiar with the slogan, “If you see something, say something.” However, most Americans are unaware of what constitutes suspicious behavior that should be reported. The fear of being the victim of a mass or random shooting is on the minds of 31 percent, and 35 percent report being familiar with the advice to “Run. Hide. Fight,” which is the recommended preparedness slogan for a mass or random shooting. Americans fear many natural disasters and 68 percent believe natural disasters are capable of harming them or their property. 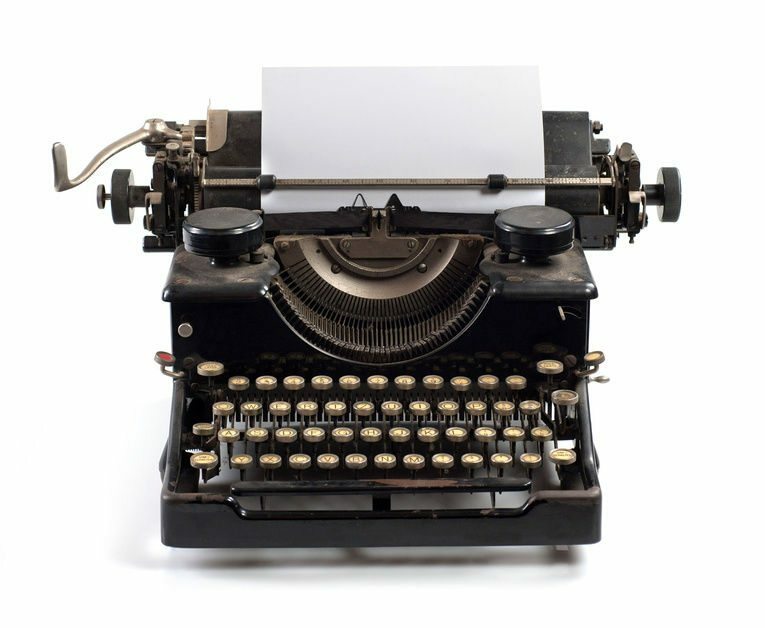 Only 38 percent of Americans have heard the advice, “Don’t wait. Communicate. Make your emergency plan today.” Less than half, 41 percent (up from 32 percent in 2016), actually have an emergency plan in place for their households and 26 percent have such a plan for their pets.